A 1974 Bradley University graduate and longtime financial consultant for MassMutual Financial Group, Paul Herzog has served as the public address "Voice of the Braves" for nearly 600 Bradley men's basketball games for the past 39 seasons, including every game the Braves have played at Carver Arena and Renaissance Coliseum. In addition to his volunteer service for Bradley, Herzog has served as the volunteer public address announcer for every game the Peoria Civic Center has hosted in the IHSA Boys Basketball State Tournament during its 20-year run in the River City. While "PA" Paul is well-known for his role with Bradley Basketball and the IHSA, his community service extends far beyond Carver Arena. 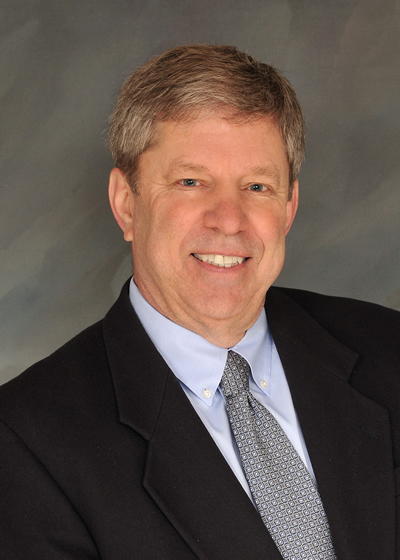 A Braves Club Board of Directors member for 20 years and a past president (1992-94) of the organization, Herzog also served as president of the Central Illinois Bradley Alumni Chapter (1983-85) and the Bradley University National Alumni Association (1990-91). He also has began emceeing the IHSA State Cross Country Championships awards ceremony in 1996. Closer to his home in Germantown Hills, Herzog has coached in youth baseball and basketball house leagues and from 2006-13 he was a member of the Germantown Hills Athletic Association Board of Directors. He served as a committe co-chair in the effort to acquire land for the expansion of youth sports in Germantown Hills, which led to the addition of 20 acres to school district property. Herzog also brought a little of the Bradley Basketball experience to the Germantown Hills Grade School Boys Basketball program by serving as the public address announcer from 2008-12. Herzog is the recipient of numerous service awards, including the Bradley Varsity Club Billy Stone Service Award, the Bradley University Lydia Moss Bradley Award, the IHSA March Madness Volunteer of the Year and the IHSA Distinguished Service Award. He was inducted into the Bradley Athletics Hall of Fame in 2011. "Alvie" Gebhardt was one of the busiest and most popular local officials. He whistled his first high school game foul in 1939, and was still doing it 27 years later. He started "calling 'em right" in the old YMCA and Caterpillar leagues in '37. It was said, "if you can survive the games in those leagues, you're ready to move on." And that he did. Gebhardt was assigned many regionals and sectionals, 15 super sectionals, and four state finals. He was the first local official to work in the NCAA Tournament, handling the quarter-finals in 1966 at Portland, Ore. He worked 10 years in the National Industrial Basketball League that included the Caterpillar Olympic Champions in 1952, and he handled seven NAIA playoffs. Unable to accept an offer to do Big 10 games because of T P & W employer duties, Alvie accepted a Missouri Conference schedule, working in that league for 11 years, frequently being assigned the "big game" involving top-ranked teams like Wichita, Louisville, Tulsa, and Cincinnati. Gebhardt officiated the game between number one ranked Cincinnati and number three ranked Illinois in Chicago attended by 22,000 fans, the largest crowd to attend a game up to that time. 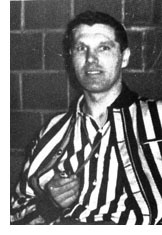 Alvie stopped officiating in 1966 after pulling an Achilles tendon. He continues to live in Peoria with wife Fran, spending the winter months in Englewood, Florida.